Are you getting tired of Tasker yet? I'm not. I let you know about a big update that pushed out recently to Tasker, it included a lengthy list of updates and new features. One of the most up front new features that is either powerful or annoying, depending on your point of view, is the ability to place up to three buttons within the permanent Tasker notification, that fire off your favorite Tasks. Whether you like the feature, or hate it, this tutorial will help you out. The steps are fairly easy, actually, once you have your tasks created, you just head into the settings, sorry, preferences for Tasker, find the Monitor section and add the tasks to the appropriate section. 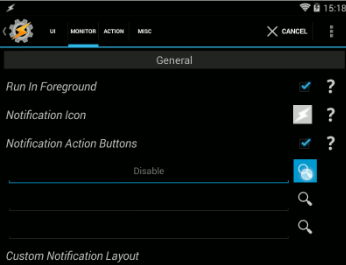 I've gone ahead and created the step by step tutorial for it in my Android customization series on Android Authority, pictures included. I am pretty straight up with my usage of this project, I have a Task in place that stops my music, one to toggle the display rotation settings on the phone and one to toggle on and off the LED flash as a flashlight. Stop Music: I listen to a lot of music on my devices, and I spend a lot of time having to pause or stop said music to pick up other tasks of my day. I truly dislike picking up a song from where I left off, they are only a few minutes long, it is no bother to start again from the beginning either. As most music players, including Google Play Music, do not provide a stop button, I end up using Tasker. Display rotation: This one is actually really annoying. On my Nexus 7 tablet, the quick settings menu includes a toggle for display rotation. That is how all Android devices should be! But, my Moto G phone does not have the option. Boooo! Once again, Tasker to the rescue. Tesla Flashlight: So, this is my weakest use case. Thing is, I work late, but the rest of the household does not, so I use the phone as a flashlight almost daily. I actually almost never trigger the light via the Notification bar, as I am rarely playing an immersive game while walking around in the dark, but I have no better immediate need tasks to put up there at this time, so there it sits. What Tasker Tasks would you put in you Notification bar?